Disruptive behavior in the classroom, poor academic performance, out-of-control emotions: dealing with adolescents can be a job and a half. Is it any wonder, then, that so many teachers are quitting after their first year of teaching? What if there was a way to calm these students down and arm them with the mindfulness skills needed to really excel in school and life? 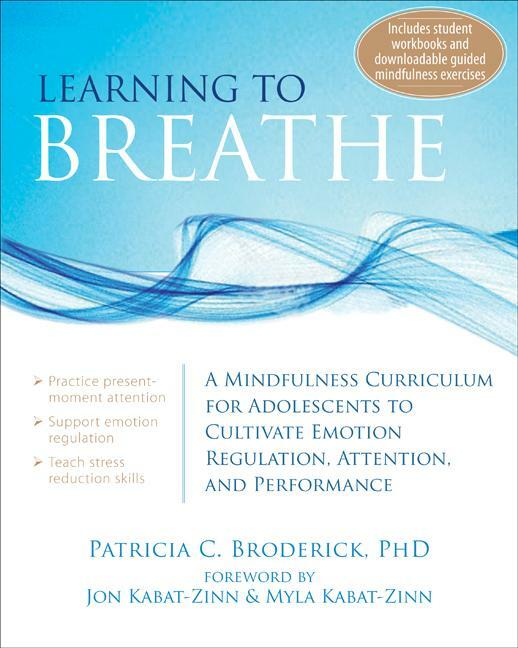 Written by mindfulness expert and licensed clinical psychologist Patricia C. Broderick, 'Learning to Breathe' is a secular program that tailors the teaching of mindfulness to the developmental needs of adolescents to help them understand their thoughts and feelings and manage distressing emotions. Students will be empowered by learning important mindfulness meditation skills that help them improve emotion regulation, reduce stress, improve overall performance, and, perhaps most importantly, develop their attention. The book also includes a website link with student handouts and homework assignments, making it an ideal classroom tool. The book integrates certain themes of mindfulness-based stress reduction (MBSR), developed by Jon Kabat-Zinn, into a program that is shorter, more accessible to students, and compatible with school curricula. Students will learn to pay attention in the moment, manage emotions as they are perceived, and gain greater control over their own feelings and actions. These mindfulness practices offer the opportunity to develop hardiness in the face of uncomfortable feelings that otherwise might provoke a response that could be harmful (e.g. 'acting out' by taking drugs, displaying violent behavior or 'acting in' by becoming more depressed). This easy-to-use manual is designed to be used by teachers, but can also be used by any mental health provider teaching adolescents emotion regulation, stress reduction and mindfulness skills. The author is a graduate of the MBSR advanced practicum at the Center for Mindfulness in Massachussetts, led by Jon Kabat-Zinn. She is also a clinical psychologist and a certified school psychologist and counselor for grades K-12. In the book, Broderick calls on her years of experience working with adolescents to outline the best strategies for dealing with disruption in the classroom and emotions that are out of hand. 'Learning to Breathe' is the perfect tool for empowering students as they grapple with the psychological tasks of adolescence. Patricia C. Broderick, PhD , is a research associate at the Pennsylvania State Prevention Research Center and founder of the Stress Reduction Center at West Chester University in Pennsylvania. She is a licensed clinical psychologist, a certified school psychologist and counselor for grades K-12, and she is a graduate of the mindfulness-based stress reduction advanced practicum at the Center for Mindfulness at UMASS. In addition, she is the author of 'The Life Span: Human Development for Helping Professionals', a textbook for graduate-level students and mental health professionals.